This time, with my Iga-yaki Toban (donabe skillet). 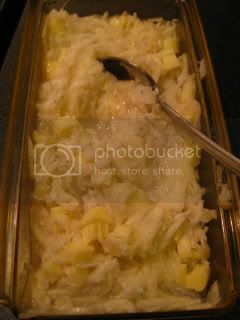 I shredded some about 7 oz yama-imo (mountain yam), and mixed with 2T steamed shirasu (baby white fish), 1.5tsp shio-koji (can be substituted with a good pinch of sea salt), 1 tspkuzuko (arrowroot starch), and 2T shredded Swiss cheese. 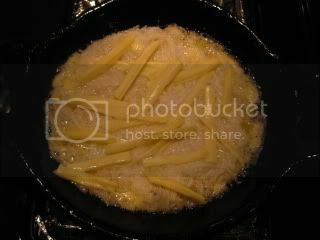 The mixture was poured into oiled heated toban, and topped with some more cheese. It was cooked for 4-5 minutes over medium-heat and finished in broiler to brown the surface. To serve, it was garnished with some minced scallion. For vegetarian version, you can simply omit shirasu fish, and it would still taste very flavorful. It was great. Outside was nicely crisp and inside was gooey. Another sake-friendly dish.